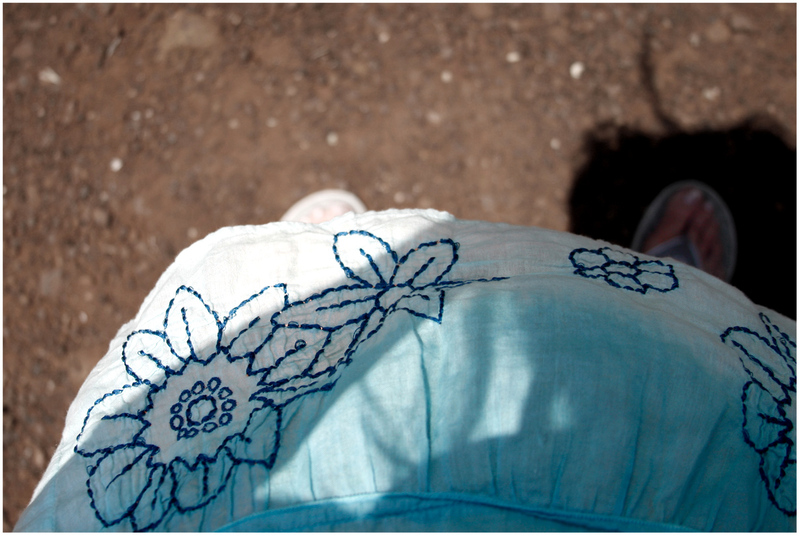 my skirt caught by the wind. what i like the very best about this shot is my shadow cast across the skirt's billowiness, the shadow straggles of my ponytail behind my arm and flopping onto the concrete above my foot as i tilt my head down to take the picture. i remember once giving that tip to robin - take ponytail elastics to keep your hair up and out of the image. in a hot wind, my ponytail is never neat - actually not neat ever, but especially in a hot summer wind when i have ceased to care. there is no doubt i will remember this hot hot summer, but this image places me here in the middle of it all; i will remember the heat of that wind, of that particular day. it has not been all heat and dreams and lack of rain. there has been some summerness despite all those things. august will find me in two places this year. susannah's august break and live it to the full's e-course: emerge. one of those places is about less words, if any, the other about transitions. i have no idea what it will look like here, but i am excited. i am unable to keep quiet, i've tried before, i know, so there will be words, but fewer of them. at least that is the plan. :) that is the august break plan. emerge may change that, may find me needing to write pages and pages of who knows what, but my heart says it will allow me to sit with a few things in silence before saying them. the two may be a perfect fit. expect me here every day to show you some of my other summer. It's so funny that you posted this, I have been on the fence about the emerge course...one day saying I will do it, the next day, not. I am already signed up for August Break! Love the photo, the day last week when it was so hot here, there was a strong breeze, it was a hot wind. i'll be doing August Break - no words is the best fit for me. There's something about photos taken looking down at our feet that really put you there in the moment - when viewed later, quickly take you back to the feeling you had that day. leslye - you're right. there are the pictures others take of us standing at a certain spot, but the pictures we take of ourselves on that spot ring more true. less a documentation, more a diary. one of my favorite photos . by one of my favorite people . love you ..
August Break with few words sounds so good. Let me think on this, could it be a good idea.